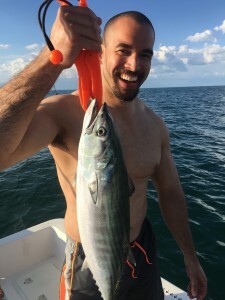 Wilmington Fishing Charters | Spring Bonito Blitz! in short, its Time to Book your Fishing Charter. Well folks we are in the North Carolina annual coastal baitfish migration, the Atlantic Bonito are here as is the Wilmington Fishing Charters Spring Fishing Season! Currently, the nearshore waters are between 60 and 67 degrees from 1 mile out to 10 miles as the warm days are rapidly bringing the temps up. The inshore waters are between 64 and 75 degrees depending on the tide (lower outgoing tide is the warmest water in the estuaries right now and is helping the fish become more active and thus more hungry. The Atlantic Bonito have showed up and as most locals know, one of our best eating tuna and the only edible one most folks get a shot at each year (since the other edible tuna are at the Gulf Stream 55 miles offshore). We are seeing a healthy class of Bonito so far in this seasons run with many having that desired “football” shape. We are catching them both with deep divers and sight fishing with diamond jigs and casting jigs. Note: Be sue to have your drags loose and have the net ready! 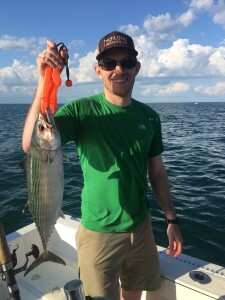 Bottom Fishing is a popular choice this time of year for many of our Wilmington Fishing Charters clients. Bottom Fishing is picking up swiftly with many keeper Black Seabass, Silver Snapper, Flounder, Grey Trout and Sharks this week. We are using fresh cut bait, live baits and jigs this time of year that match the current baits in the area. Right now we have a run of silverside anchovies that are between 2 and 3 inches; therefore, our jigs and strip baits are to the same specks. .
Our Inshore Fishing Charters are picking up as we are catching flounder, red drum, black drum and speckled trout. The Flounder are coming from the very backs of the creeks and estuaries where they can lay in the warmer waters and sun-heated sands. The Red Drum are coming from both the warm flats and the deepwater docks in the creeks as they are feeding on the bait that is flooding our estuaries currently. Most of the bait inshore right now is the spring hatch from a month or two ago which means the smaller sides bait the better right now, whereas later in the season the opposite is true. Black Drum are feeding on the edges of oyster bars and dock pilings on crustaceans and shrimp. Trout are in the swifter moving waters feeding on baitfish rapidly moving through the water column. Basically, our inshore fishery is about as good as it gets right now for our Spring fishing season. This entry was posted in Fishing Reports, ProFishNC News and tagged Figure Eight Island Fishing Charters, Topsail Beach Fishing Charters, Wilmington Charter Fishing, Wrightsville Beach Fishing Charters on April 26, 2016 by admin. Continuing to perfect the art of mounting fish.